Sorcerer Radio guest and former Disney animator (The Lion King; Beauty and the Beast; Aladdin; Mulan) is ready to meet and greet fans during Wizard World Nashville Comic Con October 18-20, 2013! 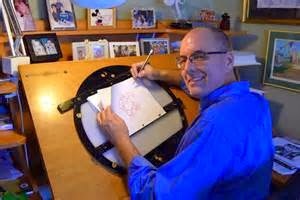 Tom Bancroft has almost 25 years of experience in the animation industry, most of which was for Walt Disney Feature Animation where he was an animator for 11 years. He has been nominated for Annie and Rueben awards, spoken at the Kennedy Center and awarded an entry into the Chicago Children’s Film Festival. While at Disney, Bancroft had the opportunity to contribute his talents to 10 animated feature films, five animated shorts, and numerous special projects and commercials. Among the classic films on which he worked are, “Beauty and the Beast,” “The Lion King,” “Aladdin,” “Mulan” and “Brother Bear.” He was also a character designer and director for Big Idea Productions, makers of the family-friendly “Veggietales” video series. In 2005, Bancroft had his popular art instruction book “Creating Characters with Personality” published by Watson-Guptill Publishers. It has become the most recognized book on designing characters for animation, video games, comic books and cartooning, and is a required textbook at many art schools around the world. Focal Press recently published his second book, “Character Mentor” and it is already one of their best-selling art instruction books. He has also illustrated over 50 children’s books, created a comic book series (Opposite Forces), and created character designs for TV, Film, and Video games. Bancroft and his family reside in Franklin, Tennessee. Other celebrities scheduled to appear at Wizard World Nashville Comic Con October 18-20, 2013 include: James Marster (Spike, from “Buffy the Vampire Slayer"), WWE® Superstar Daniel Bryan®, Norman Reedus (The Walking Dead), Sean Patrick Flanery (The Boondock Saints), Chandler Riggs (The Walking Dead), Henry Winkler (Happy Days), Peter Mayhew (Chewbacca), Stan Lee (Marvel), and Sara Underwood (Attack of the Show!) and many more! For more details on Wizard World Comic Con Nashville tickets, celebrity guests, events and signings visit - http://www.wizardworld.com/home-nashville.html.